Sharjah is a beautiful place to visit! 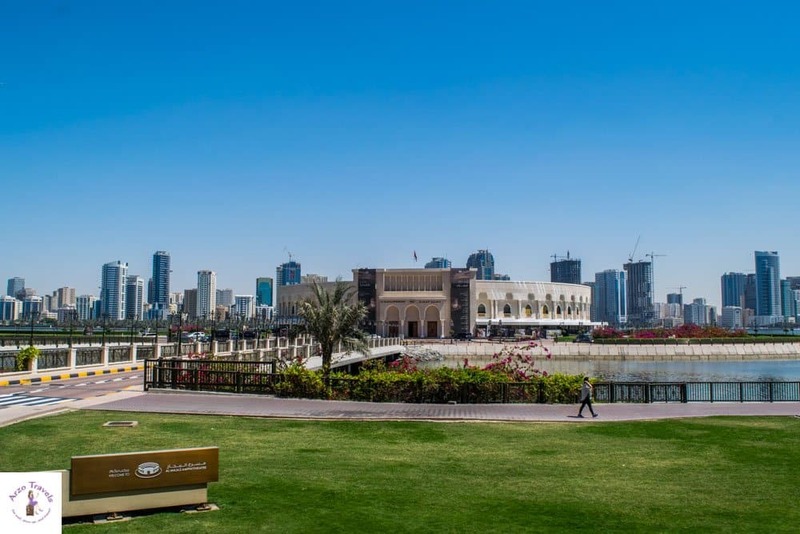 Why Visit Sharjah – Reasons I loved it! When I spoke these words out loud, I saw some people looking at me in surprise. An expat friend of mine from Dubai was especially taken aback by this statement. It seems, people in Dubai do know even know about Sharjah attractions and why to visit. But yes, Sharjah is a beautiful place and I was so positively surprised that I can truly recommend a trip there to anyone. 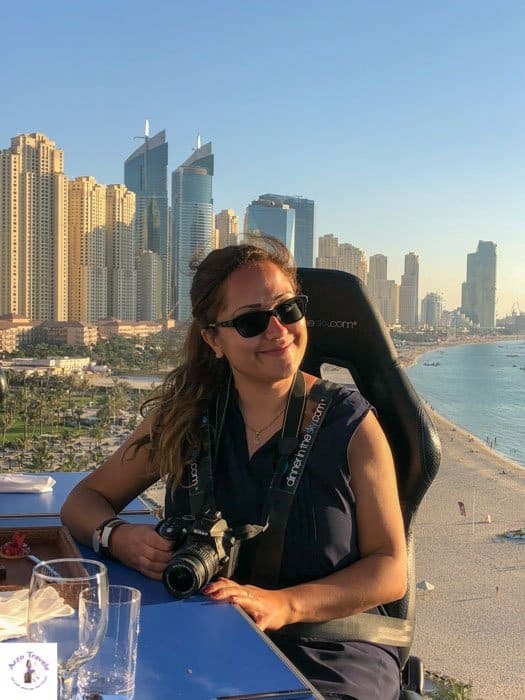 Before talking about the best things to do in Sharjah, here is why I loved my trip to the third biggest Emirati of the UAE. Dubai is expensive. Full stop. Sharjah is way cheaper. Accommodations are cheaper, taxis are cheaper, activities are cheaper, and food is cheaper. Sure, Dubai is like a city from a different planet, but you get good value for your money in Sharjah. Sharjah is less well-known and less crowded. Even during the peak season, you will have the city almost all to yourself. Of course, other tourists have discovered the place, but you will not have to share the space as you would in Dubai. Like the rest of the UAE, Sharjah feels incredibly safe. As a solo female traveler, I did not have to worry about being robbed or anything (well, once I was followed by a car that actually went along wherever I walked, but after taking out my phone and very obviously taking pictures of the person in the car, he got scared and drove off quickly). Also, it is clean and “developed.” If you are NOT looking for an adventurous trip where you can never be sure what to expect – will public transportation work, will there be air-conditioned places, etc. – then Sharjah is the place to go. Whether you visit with or without kids, Sharjah is a great place to spend a vacation with the family. There are so many places and activities (most often free) that you can have a great trip with your kids. But even if you travel without kids – or do not even like them – you will not stumble upon too many here, as places are not crowded. One of the elements for me as to whether to fall in love with a city or not is how easy it is to actually get around – not only by taxi or public transportation, but by actually walking. Sharjah is one of the most pedestrian-friendly cities I have ever come across, e.g. you can basically just stroll along the whole waterfront without many obstacles. Walking has never been easier. It seemed like Sharjah was quite lush to me. 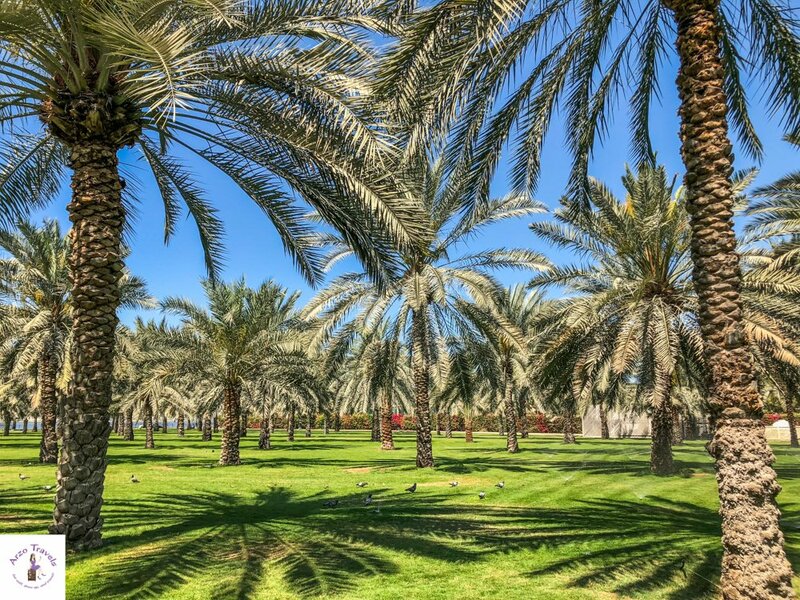 Not all around and everywhere, but if you walk from the Central Souk towards the Noor Mosque, you will find plenty of green meadows with palms in them. I always feel weird when I see the fields of colorful flowers in Dubai along of Dubai´s streets and highways- they seem misplaced. Though there are some flowers in Sharjah, it feels more natural. Palms are everywhere in Sharjah, which makes this place pretty nice, and also makes a great contrast to the high buildings and modern paths. 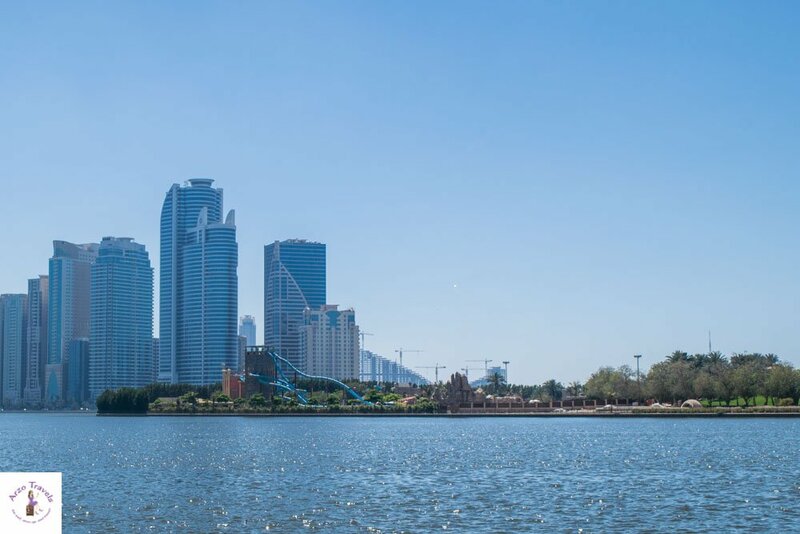 Sharjah is perfectly located – it takes only 15 minutes to get to Dubai (Old Town), and you are close to Ras al Khaimah and even Dubai (for tips on things to do in Dubai click here). The Dubai International Airport is also quite close (20minutes drive). 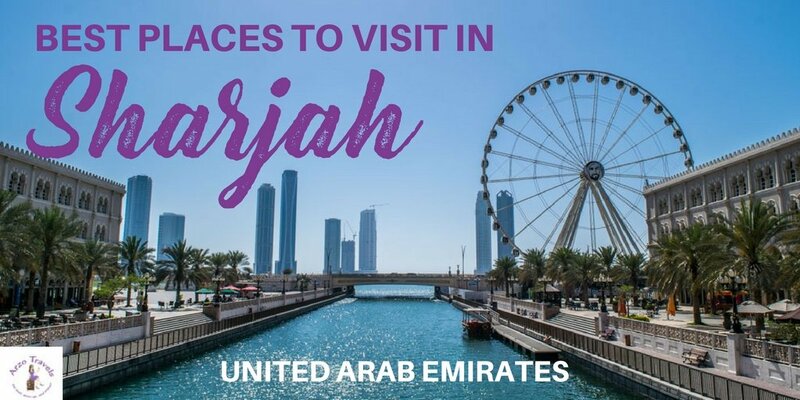 You can even do day trips to Abu Dhabi easily. 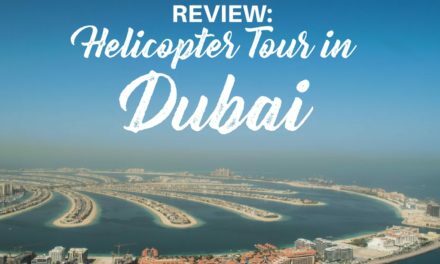 So it is the ideal place when you want to get around the UAE. On the other hand, Sharjah is more conservative than Dubai. As I do not drink alcohol, I did not even realize that there is no alcohol allowed in Sharjah! So, it is not a place for those who want to party hard and drink. You do not have to wear a scarf and you can wear shorts and tops, but you can see some differences from Dubai. With more tourists coming, especially from the UK and Russia, this might change eventually and people can wear what they want. It is a bit sleepy. While I enjoyed the quietness, especially compared to Dubai, it can get boring if you are looking for action. If you are looking for a real, authentic Emirate experience, you will not find it in Sharjah either. Though it seems to take pride in being more authentic and traditional, I could not see it. For the most authentic feeling, you probably have to visit Ras al Khaimah, for example. After all, Sharjah is quite modern, though there are some areas that have not been developed yet. When it comes to construction work, you will see that there is a lot going on. It is no less busy than Dubai, and actually, you will not be able to look around without seeing some construction work somewhere. Also, there are a lot of mosques. They are extremely pretty to look at and if you are Muslim and religious you will appreciate the muezzin calling for prayers – especially as you will hear that five times a day. 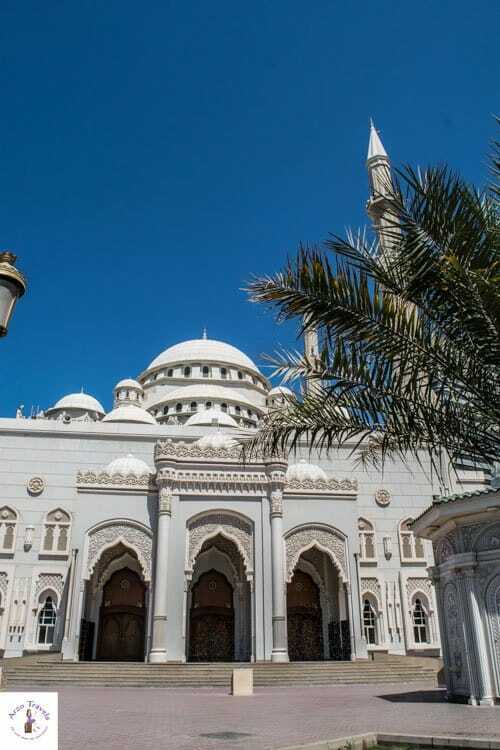 No matter where you are in Sharjah – you will always hear the prayer´s call. Even at night! So, for the ones who wake up easily and have problems to fall asleep again, this might be a bit of an issue. 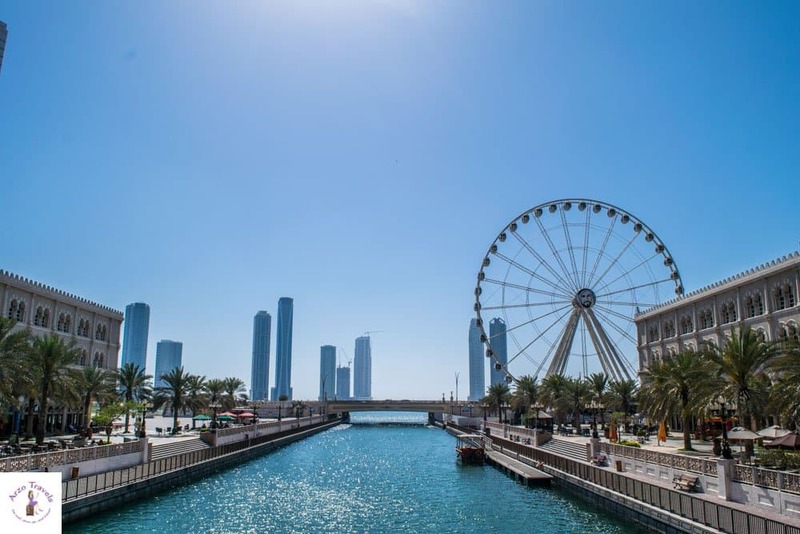 Before jumping to the Sharjah itinerary, or better the best landmarks, here is a bit more info for your first Sharjah trip. 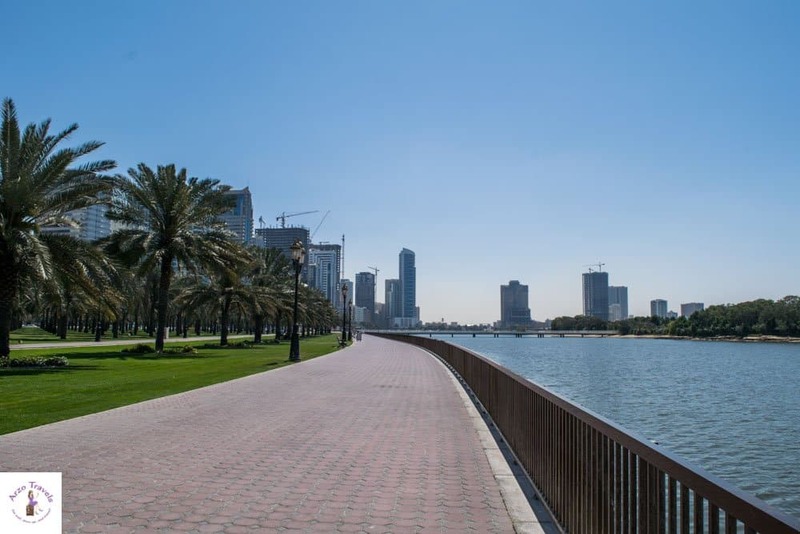 Sharjah is a perfect place to walk. Of course, you cannot walk around the entire city (it is not that small), but you can get to many attractions just by walking, and you would only have to take a taxi once in a while. Another great way to get around is on a city sightseeing bus – the hop-on and hop-off bus will drop you off at the most popular spots and then you can just hop on again, or walk, to the next spot. As mentioned, Sharjah is way more affordable than Dubai. Especially when it comes to accommodations. 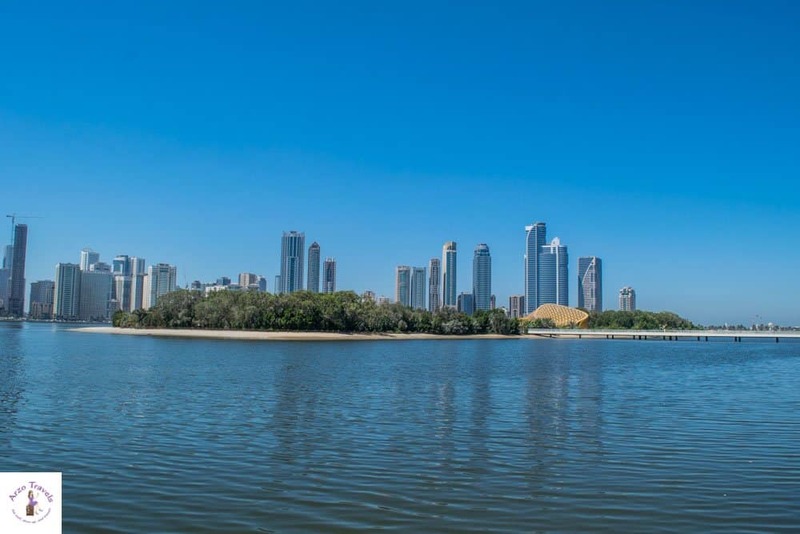 I recommend staying at the waterfront, so that you are close to many popular Sharjah attractions. I booked a very nice hotel room in a five-star hotel for under 70€ – that rate is impossible in Dubai (booked via Booking.com). If you like to have a hotel with a pool and beach access, you can book a room at the Radisson Blu. 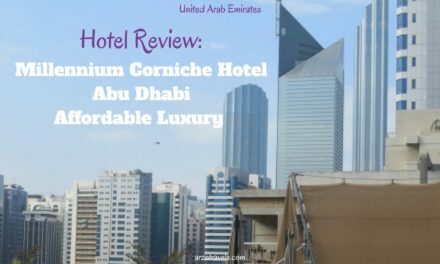 If you are on a budget, you could book a room at Ryan Corniche Hotel Sharjah. This 2-star hotel is probably way better than most 3-star hotels, though it is located at the end of the waterfront, which makes getting around a bit more difficult (but there is a little park just in front of it, so perfect if you are with kids). Shopping in Sharjah is different than shopping in Dubai or Abu Dhabi. 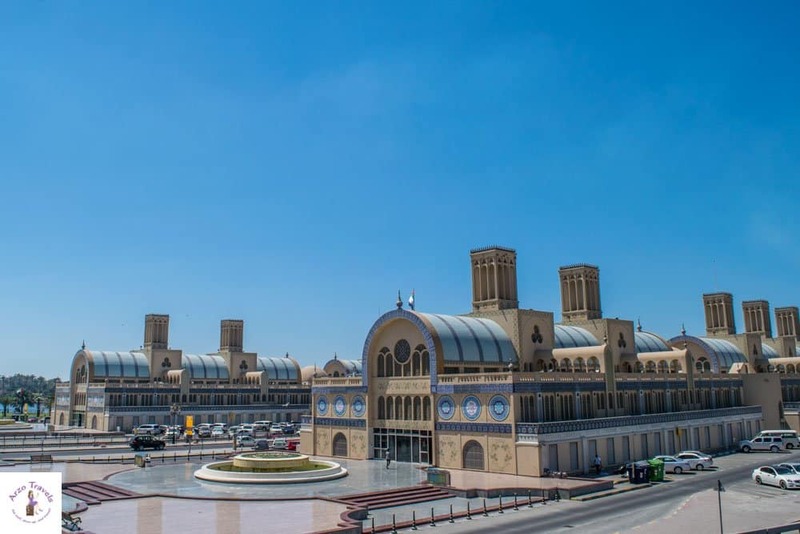 While you have huge malls in these two cities (and some in Sharjah as well), the most prominent shopping mall, the Blue Souk, is completely different. It is cute, with an incredibly beautiful design. If you look closely at the picture below you will probably notice it is in the shape of a train – another quite unique thing about it. 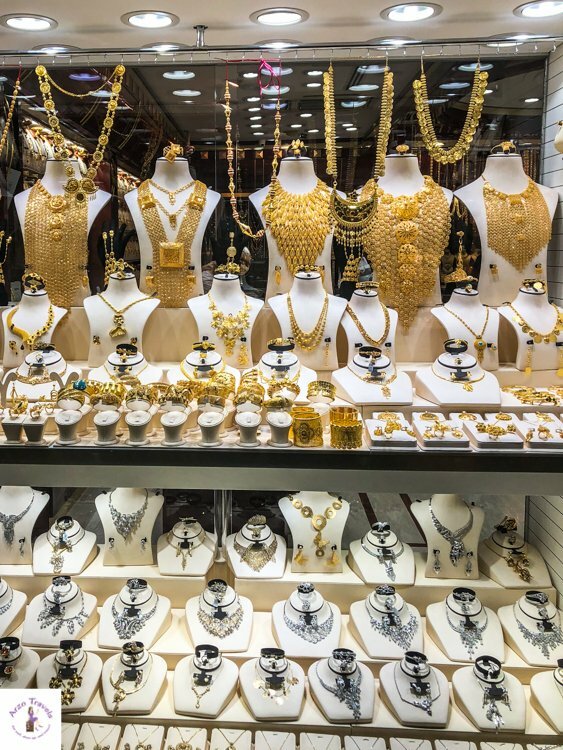 You can buy gold and silver (prices are about the same as in Dubai Gold Souk, though I heard it is a bit cheaper), souvenirs, and Arabian-styled clothes (no western brands like you normally see them in Dubai). It was less crowded and much smaller than other malls in the UAE. However, it is a beautiful place to visit and, not surprisingly, one of the main tourist sites in Sharjah. And when shopping here, you will learn that the prices for all sorts of stuff are way cheaper than in Dubai. 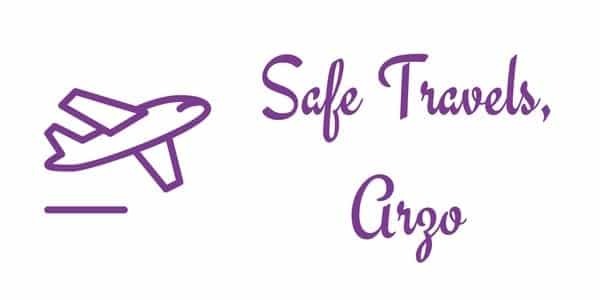 This is also the starting point for both of the hop-on and hop-off routes. 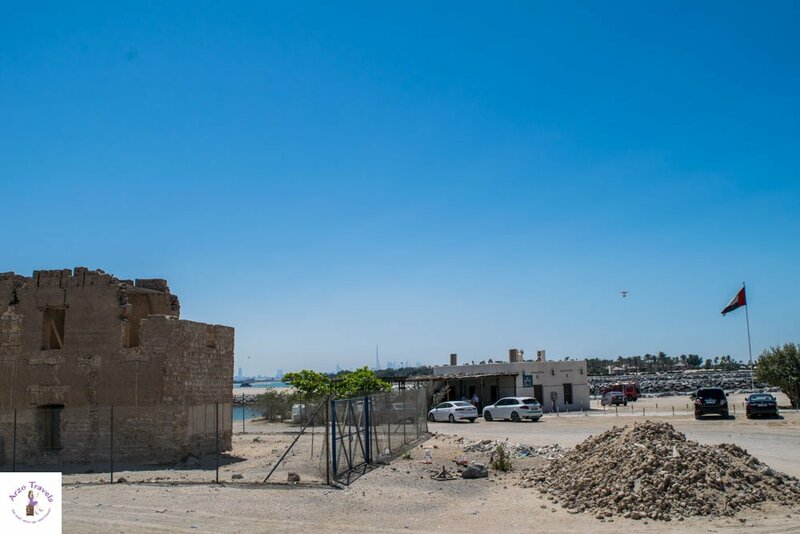 Though I had a ticket for the sightseeing bus, on my second day, I made it my mission to walk along the Corniche – and I was not disappointed at all. 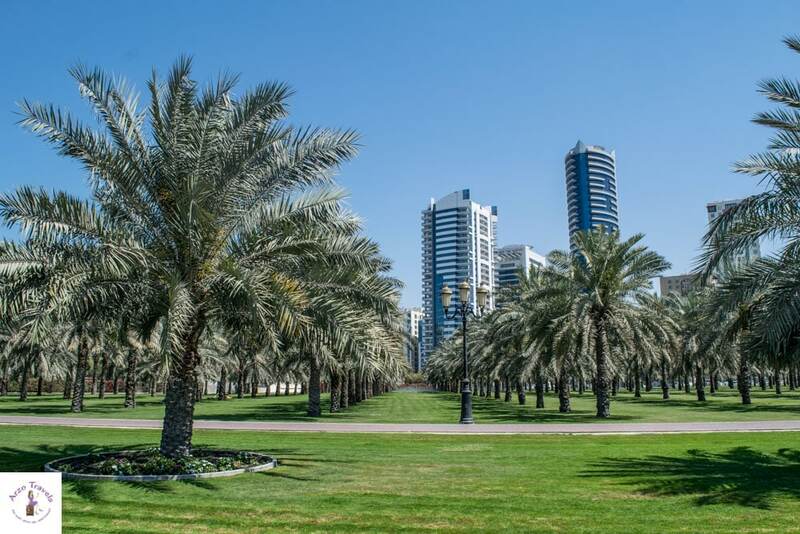 Before heading to the next Sharjah attraction – Al Noor Island – take your time and chill at the Palm Tree Oasis. I saw many bringing their own portable chairs or blankets and having picnics here (it is a popular place to visit, especially in the evening). Al Noor Island is another beautiful piece of architecture, which somehow makes me think of the Louvre in Abu Dhabi – at least from a distance. For an entrance fee of about 12€, you can cross the beautiful bridge (how gorgeous is this?!) and you can spend a few hours on the island. There is a butterfly garden, some art collections, and playgrounds for kids. I did not visit, as I am secretly scared of butterflies. Plus, the reviews were mixed, and many visitors thought it was too expensive and not a good value. However, the building itself is amazing and I fell in love with its curved form. In the evenings, when the lights turn on, it gets even prettier! There is no shortage of mosques in the city. Seriously, there are mosques wherever you visit (to date, there have been 600 mosques in Sharjah). Most of them are designed similarly in a beautiful, Turkish Ottoman style – the Noor Mosque is probably one of the prettiest ones. 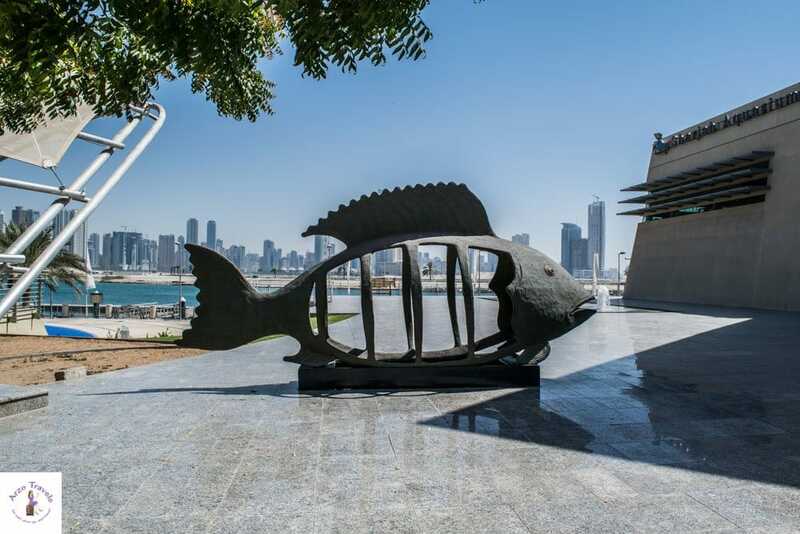 The perfect location, just at the Corniche, is another reason to visit. Where else will you find a mosque that sits in such a great location? Oh, what a beautiful waterfront! 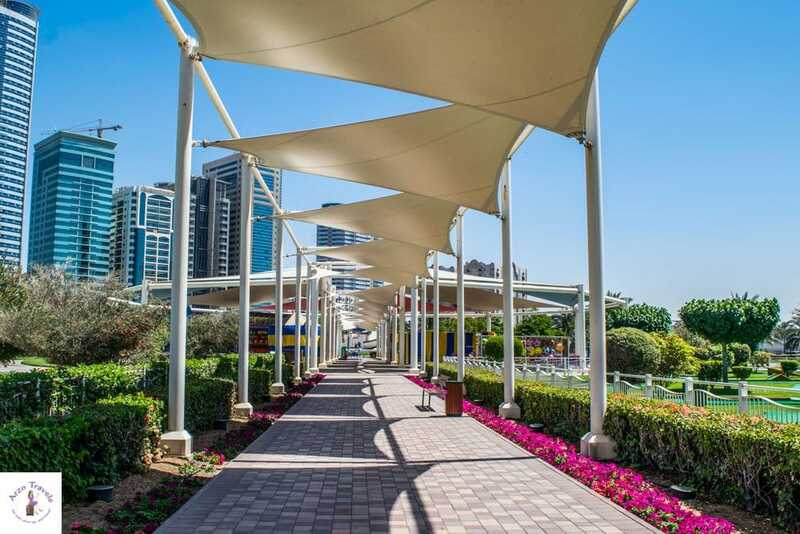 It is a 12-minute walk from the Al Noor Mosque to the Al Majaz Waterfront. The area is very lovely. You can rent go-karts for the younger ones and there are some playgrounds for the kids, but you can also play mini-golf. 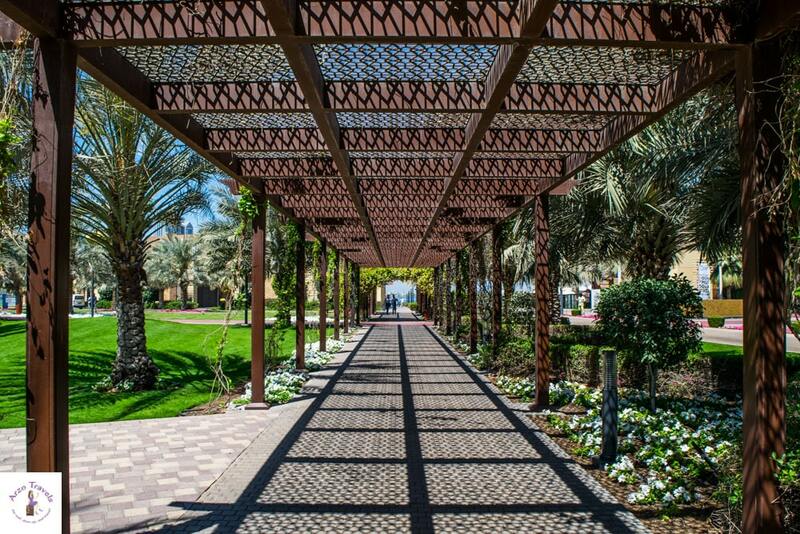 Adults will love the restaurants and cafes overlooking the Khaled Lagoon. And in the evenings, there is a nice fountain show that goes on (I got mixed replied about the timing of the water dance show, and the tourism board has not been much help to answer this question, but to my knowledge, it starts after 7 pm and is several times a day). It is probably one of the best places to visit at night in Sharjah (by the way, for me, night means after the sun sets). If you are staying for several days, this is probably a good way to top off your day! It can get chilly in the evenings, but it is still my second favorite place to see in Sharjah. This is probably all you can schedule in a day, especially if you walk, but be assured that there are more things to see in Sharjah. 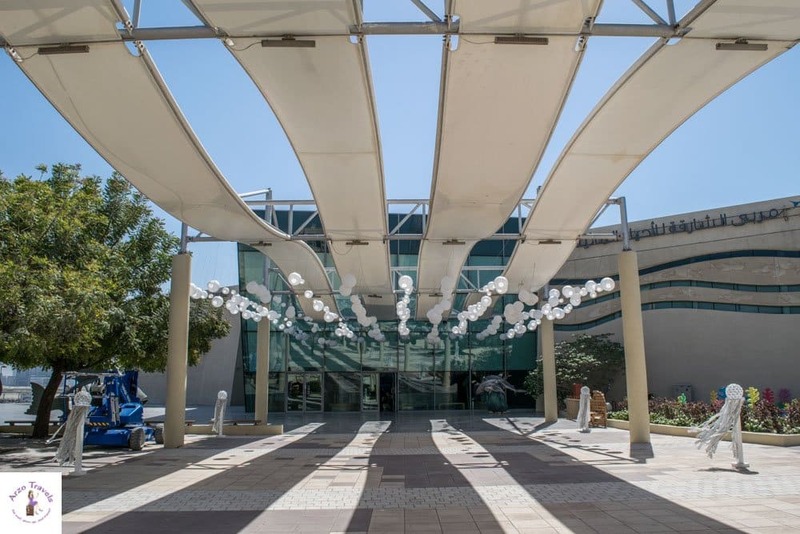 Close to the Al Majaz is the Al Majaz Amphitheater, and if you are lucky, you can see a concert or festival during your stay. Events do not take place weekly or even daily. Since there were no activities scheduled during my time there, I just strolled around the area and did not go inside. You can check out events here – it is definitely a beautiful building and looks quite classy. If you visit Sharjah with kids, they will probably want to spend a day at the Al Montazah Waterpark. If you think you can get away with not visiting, you might be disappointed. 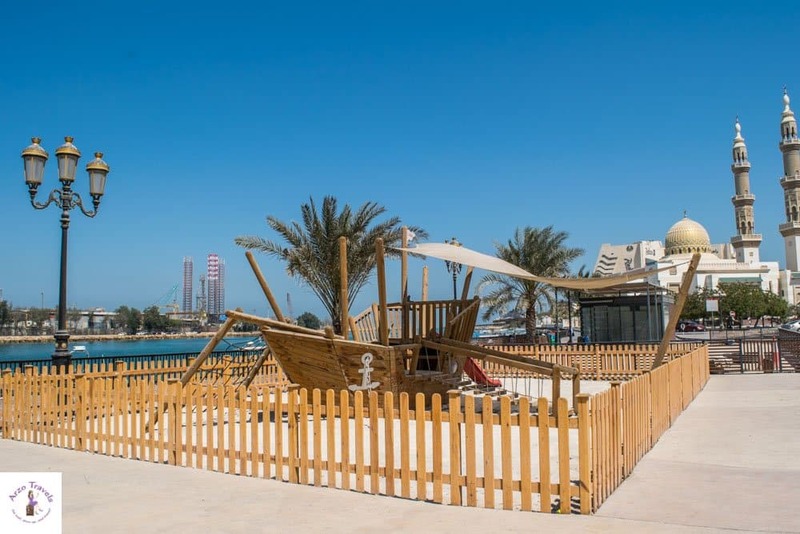 If you are walking along the Corniche, your kids will probably spot the slides from a distance and ask what is there. So, while the waterpark had some pretty bad reviews a few years ago, it seems to have gotten much better, with more slides and activities now. 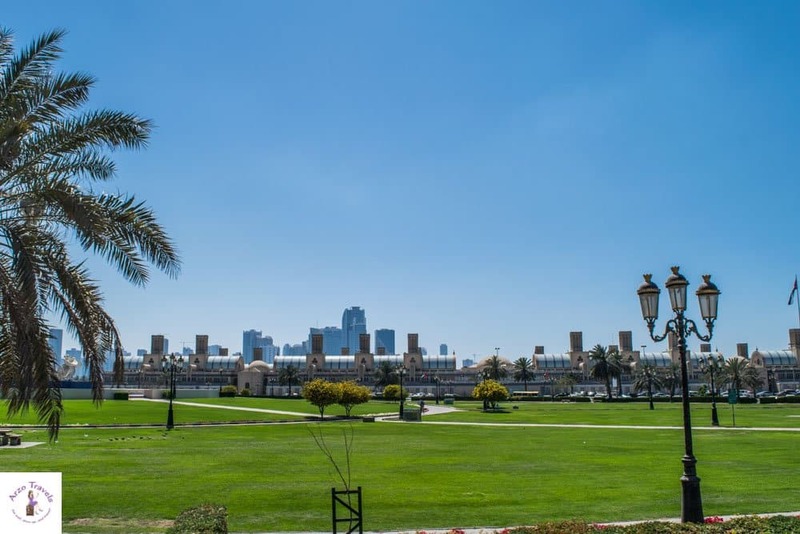 So if you need a day to enjoy being in the water, then spend it at Al Montazah Park. Sharjah has some nice public (and private) beaches. Due to the weather conditions, you can spend a day at the beach even in winter. While it can be windy, it is still warm and the beaches are pretty empty. 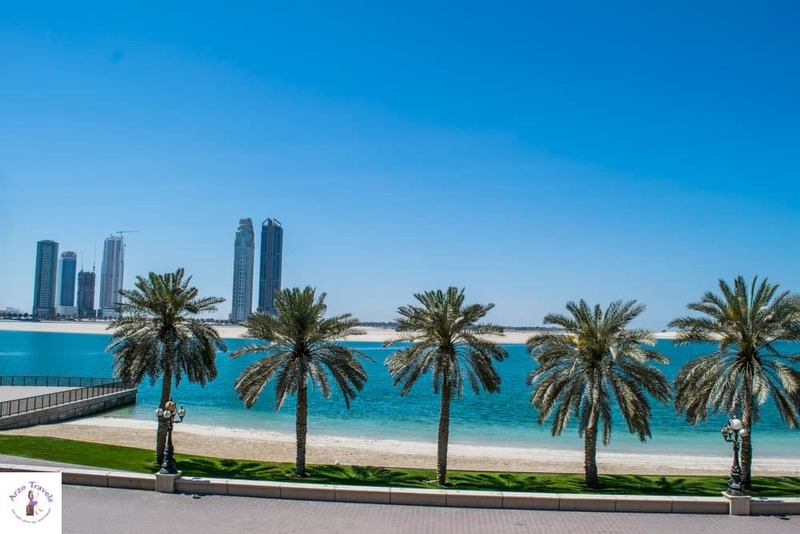 Choose a free beach (e.g., Al Meena Street or Al Montazah Street) or, for a bit more privacy, use a beach section that belongs to one of the hotels in the area. Taking pictures is officially not allowed, so this is the one right at the street which I could photograph. While the water is pristine and clear, the view is not always perfect. Look to the right and left (even into the far distance) and you will probably see some cranes and construction work. 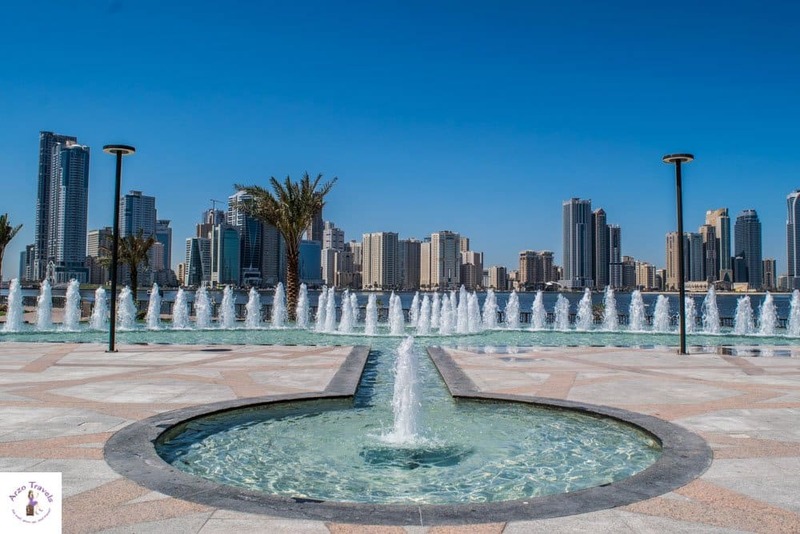 Looking for more Sharjah tourist attractions? How could it be any different? Sharjah also has an aquarium, and not only for kids. The hop-on bus stops here, and whether you visit the Aquarium or not, it is worth it to get out here. The area around it is lovely and the kids can play. If you would like to have some alone time, go behind the Aquarium where you can be by the coast. There is not much more than a few construction projects going on, and while it does not sound inviting, it is pretty nice to sit there and enjoy some quiet time. 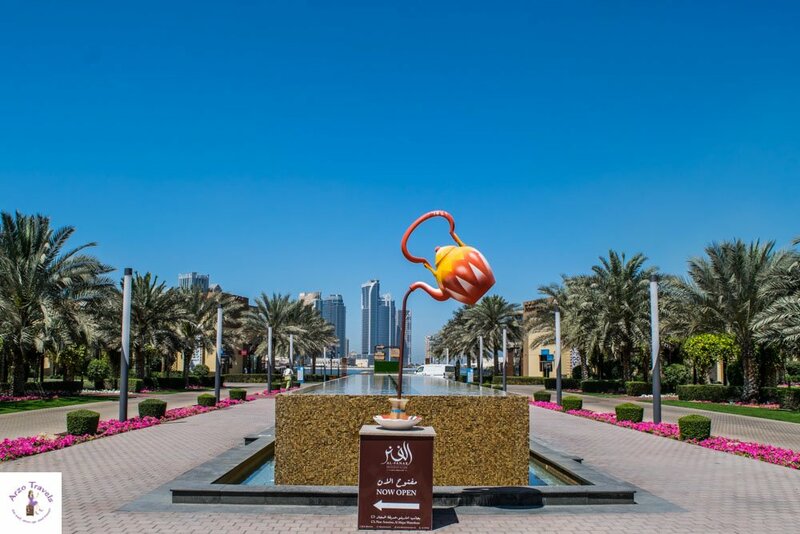 Wondering what else to see in Sharjah? Well, here is my top tip: this area is extremely lovely. 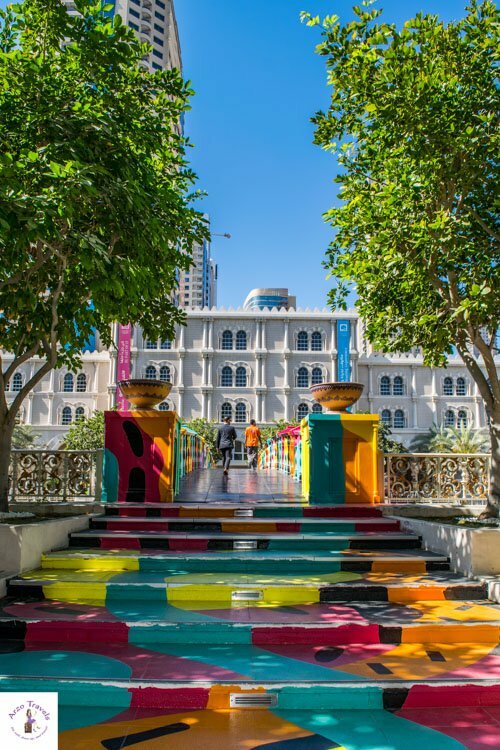 Though it would be too much to label it as an “alternative” area, it is the most stylish part of Sharjah, with a cool and colorful staircase/bridge. It almost does not feel real, and you have a great view of the Eye of the Emirates Wheel (which was out of order while I was there) and the manmade canal. You can do boat tours, do some shopping, and have a nice dinner. There are lots of things to do with children, too. Rent a go-kart, play on the playground, etc. If you visit after 5 pm, do not miss the Al Qasba Musical Fountain Show. It takes place once an hour between 5 pm and 11:30 pm (exact timing here). It is not only a fun place to cool down (if you just jump into the fountain) but also fun to see. No trip to the UAE would be complete without a trip to the desert. The desert is authentic and fun. Going on a 4×4 adventure and having a BBQ in the desert (plus stargazing) is a must-do activity in Sharjah. 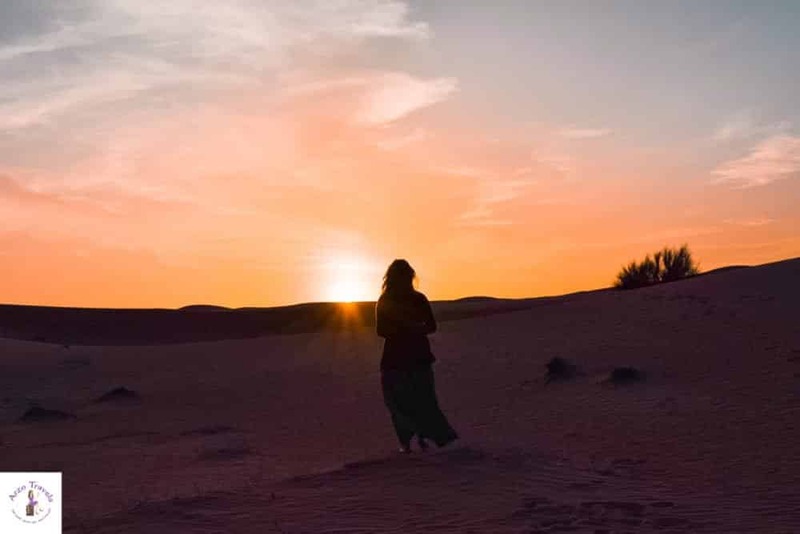 If you book your trip, you will probably have the desert safari in Dubai’s desert, but that really does not matter as it is a fantastic way to end your day and collect unique memories. There are desert tours in Dubai with a pick up in Sharjah – find out more here. 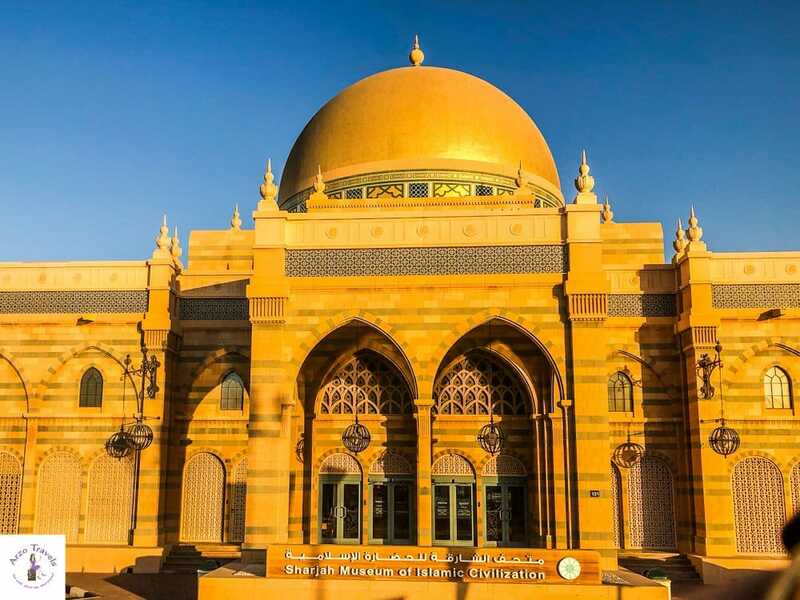 Unfortunately, I ran out of time before I could actually visit the Sharjah Museum of Islamic Cultivation, but this would have been the museum I would have loved to visit. Apparently, Sharjah has more museums than Dubai, and this one is one of the most popular ones. It was also the first one to open in the city (in 1996). It has a lot of interesting artifacts of the Islamic culture and tells you about the history of Islam, and it is said to have an impressive interior, so it is more than just learning about the religion. Location: It is located near the Radisson Blu Hotel on the waterfront (the City Sightseeing bus stops here). I hope you are inspired to visit Sharjah and enjoy your time there. 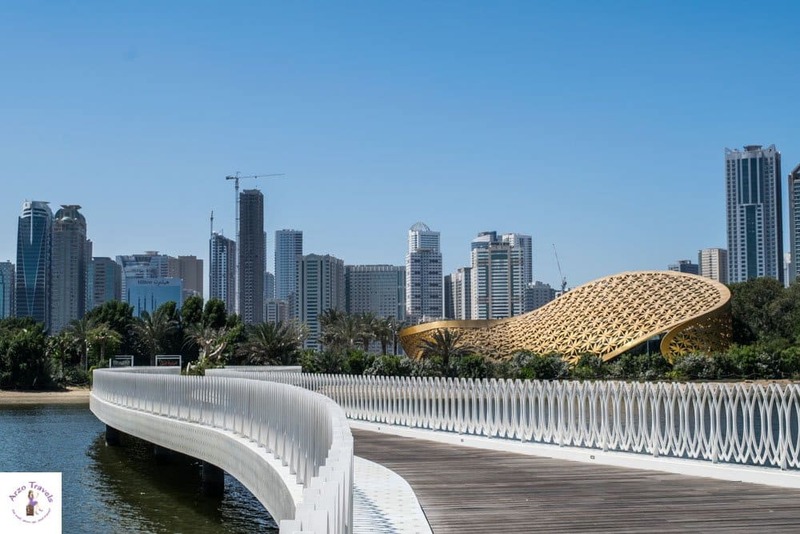 You´ll see that there is a lot to do, and even if you do not want to spend your whole time there, you should plan for at least two days in Sharjah. Abu Dhabi or Dubai – Which is the Better Place to Visit?